Persson is certainly on a quest to preserve civilization as we know it. H&M, by its own admission, is planning to open 400 new stores in 2015 alone. There’s a certain irony in his statement, as well, considering H&M’s constant fending off of charges that it’s starving its workers in Cambodia. That’s not to say H&M hasn’t flexed its considerable muscle for the greater good. The world’s second-largest clothier is currently the top buyer of organic cotton. In 2012, H&M launched the first global clothes-recycling initiative in all 48 of its markets. And, after a deadly building collapse in Bangladesh killed 1,133 workers in April 2013, the retailer was among the first to sign the legally binding Bangladesh Fire and Building Safety Accord. H&M has even pledged to deliver a “living wage” to more than 850,000 textile workers in Bangladesh and Cambodia by 2018, a move that labor groups have greeted with guarded optimism. But no matter how many “Conscious” collections H&M flaunts, “closed-loop” processes it innovates, or factory initiatives it spearheads, the truth remains that H&M traffics in cheap clothes made by even cheaper labor. And therein lies the problem. Never mind that we live on a planet with finite resources. Nor the fact that millions of tons of textiles are consigned to greenhouse-gas-belching landfills every year. Or even the revelation that our castoff duds are flooding secondary markets in the third world, often to the detriment of indigenous producers. With recent reports of workers literally working themselves to death to keep pace, shouldn’t the “at least the poor have a job” excuse, at some point, ring hollow? “Regardless of how revolutionary the materials are, garment workers in many of the world’s poorest countries will remain stuck in the ‘fast fashion’ cycle where they persistently work very long hours to deliver big volume orders with impossibly short turnaround times, constructed at the cheapest price possible, in often life-threatening conditions,” she adds. And few retailers do fashion “faster” than H&M. 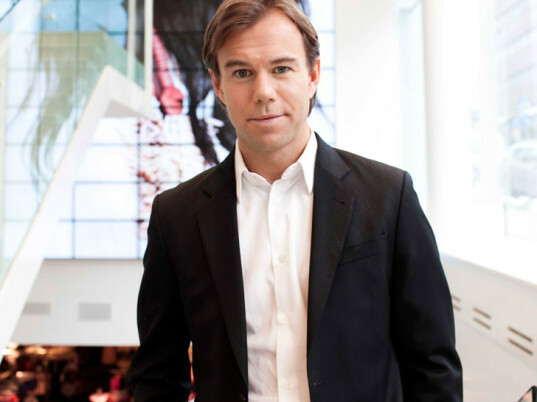 H&M CEO: Buying Less to Save the Planet Would Create "Social Catastrophe"
Karl-Johan Persson isn't a fan of the "buy less" movement that's beginning to take root. In fact, the H&M CEO warns that reducing consumer spending in the name of protecting the planet could create a "social catastrophe" for the world's poorest. In what amounts to a press release on the Guardian's "Sustainable Business" blog�which, incidentally, the Swedish apparel company sponsors�Persson says that limiting consumption would put millions of jobs at risk and stymie economic growth. "A lot of discussions are only on the environmental side, that we don�t need a lot of things really and that we could consume less of everything,� Persson, the grandson of the original H&M founder, says in the February 3 column. �But if we were to decrease 10 to 20 percent of everything we don�t need, the result on the social and economic side would be catastrophic, including a lot of lost jobs and poverty."